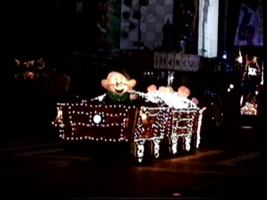 I erred in an earlier post, as the driver of the car looked very similar to the characters with the large heads that appeared in “America on Parade” and the “Epcot Center Opening Day TV Special“. 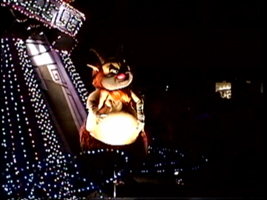 These floats were actually added to promote the Fox and the Hound Movie. 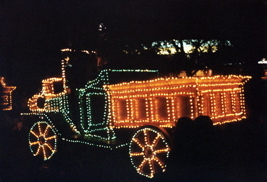 “Amos Slade’s Truck” is above right. 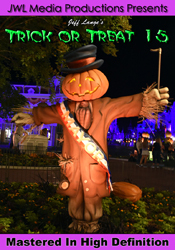 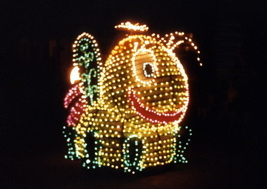 Promotional floats are a Disney tradition, having been used many times in Disney parade history. 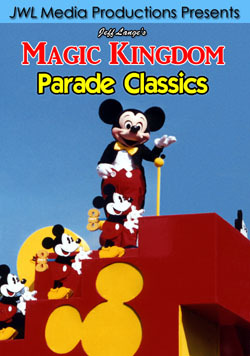 JimHillMedia has a detailed story on that practice HERE. 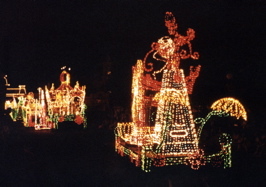 Next, we have the “it’s A Small World” section that ran from 1977 – 1991 (above and below). 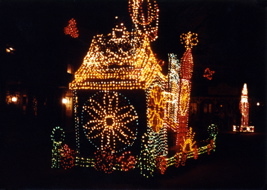 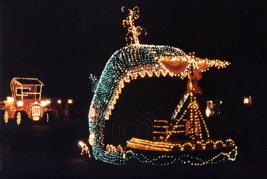 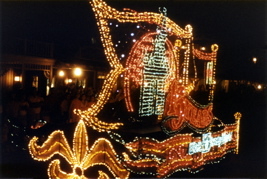 This segment actually consisted of multiple floats including the “Miniature Facade Float” (above left) and the “South Seas Float” (above right and below left). 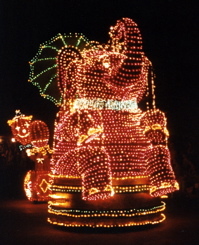 Dumbo’s “Circus Hippo float” (above right). 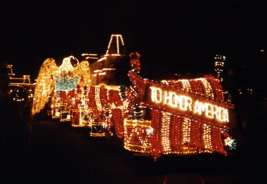 The parade concludes with the Pete’s Dragon “Elliott float” (above left) and the classic “To Honor America” (above right). 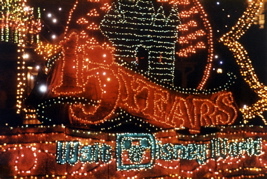 I hope everyone enjoyed my vintage photos and if there is still interest for more, I can always go back to my archives again! 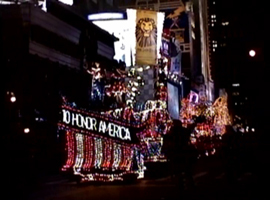 Now we move to June 14th, 1997 on 42nd St & 7th Ave in New York City. 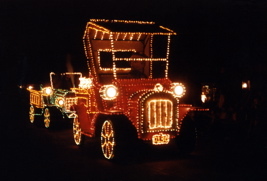 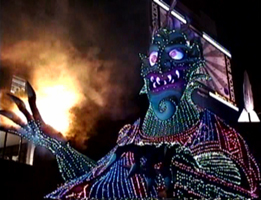 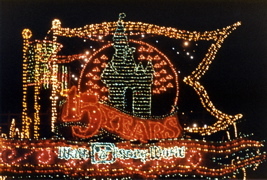 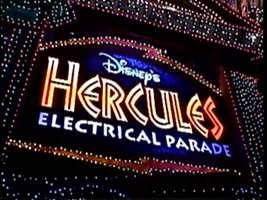 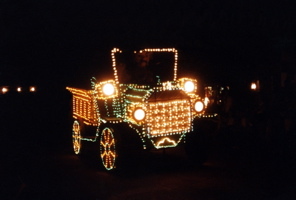 To help celebrate the world premier of Hercules the Movie, The Walt Disney company brought in the recently retired “Main Street Electrical Parade” from Disneyland and transformed it into “The Hercules Electrical Parade”. 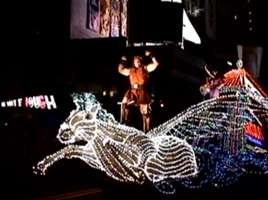 Hercules and Pegasus (above right) were the lead float in this special parade. 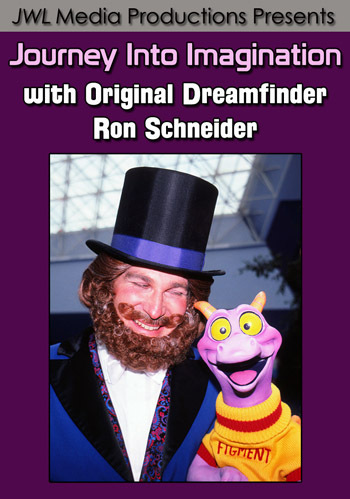 I had traveled to New York City to experience and hopefully record this once-in-a-lifetime event with my longtime friend Jim Hill, along with family and friends. 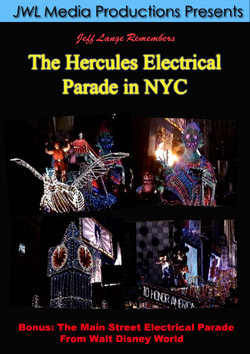 We had arrived to find the city packed and the streets over 10 people deep to view the parade. 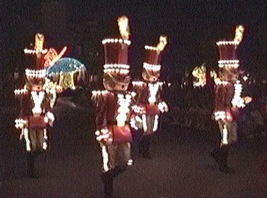 We were all considering giving up on the parade until a good friend was amazingly able to secure us a VIP viewing area. 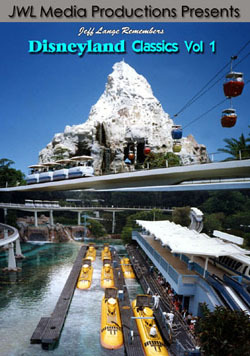 We spent time actually standing under the camera boom for E! 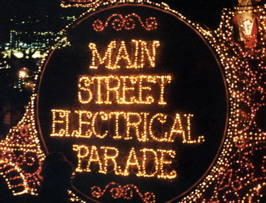 Entertainment Television! 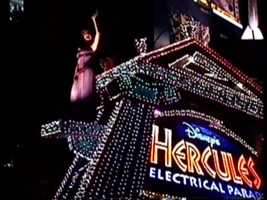 Megara is on the “Greek Temple float” (above right). 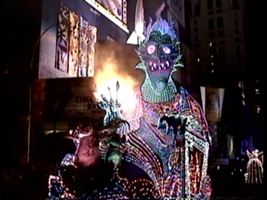 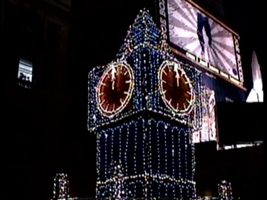 Disney arranged for the lights to be turned off on about 8 blocks of Broadway, up to the New Amsterdam Theater. 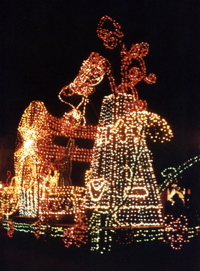 All businesses complied – with the exception of Warner Brothers. 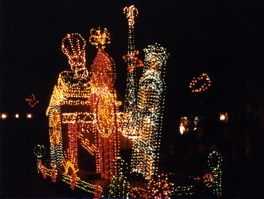 Phil is on the back of the Greek Temple Float (above right) followed by Pain and Panic riding on the Hades float (above left). 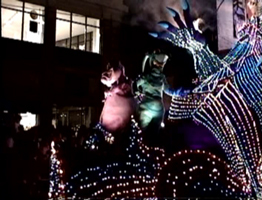 The Hades float featured real billowing fire and smoke (above left)! 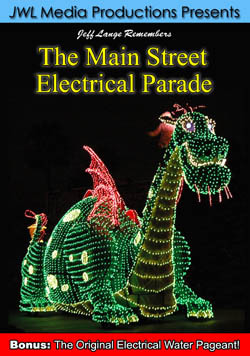 The classic Main Street Electrical Parade floats pass by the three million people who lined the streets of Manhattan that night! 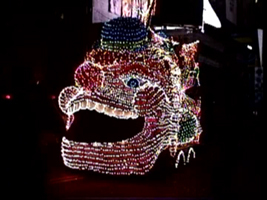 It was surreal seeing the brightly lit floats going past the tall buildings in the city! 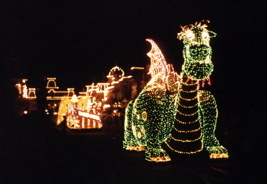 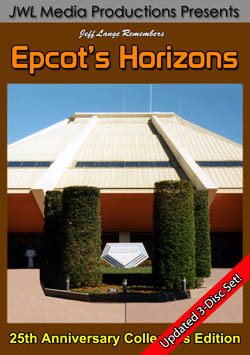 I felt like I was transported back to Walt Disney World or Disneyland for a brief moment. 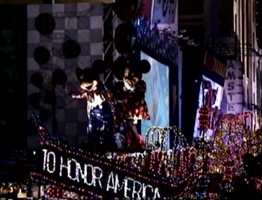 The finale was the traditional “To Honor America Float” (above) with the addition of Mickey and Minnie Mouse greeting the crowds along 42nd St & 7th Ave! 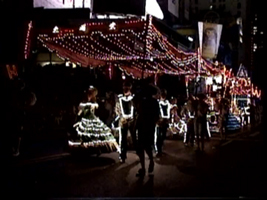 That evening was definitely an experience I will never forget! 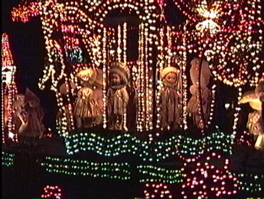 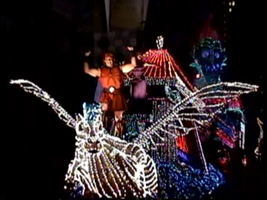 *All of the Hercules Electrical Parade images above are actual screen caps from my DVD, available below.